The oxygen at the summit of an 8,000-meter peak is so thin most humans can’t survive if plucked from sea level and dropped at the top. That’s why most mountaineers spend a month or two on a mountain before summiting, making repeated trips to progressively higher spots. This allows the body to acclimatize for the final summit push. At least that’s the tradition. But when Adrian Ballinger and Emily Harrington climbed 8,188-meter Cho Oyu in a single “lightning” push last month, they cut that step entirely. Hypoxico’s units are sealed spaces – as small as a mask, or as large as a whole room. They thin the concentration of oxygen in that space by replacing it with nitrogen. This simulates higher altitudes within the confined area. Ballinger and Harrington usually opted for a tent or head tent during training. The idea being, when placed under duress with less oxygen, the body produces more red blood cells, capillaries, and mitochondria, all of which help deliver more oxygen. The body adapts to low oxygen levels, and thus performs more efficiently. It boosts fitness and prepares the body for high-altitude climbing, without all the time spent on the side of a mountain. It had long been theorized that athletes from high-altitude climes – like Colorado or Kenya – had a physiological advantage from training in thinner air. But a 2001 study published in the Journal of Applied Physiology confirmed a significant performance boost for athletes who “live high-train low.” That means they sleep or rest in an altitude tent or chamber (or live in high mountains) and do their actual training at lower elevation, where they can still perform at maximum strength. 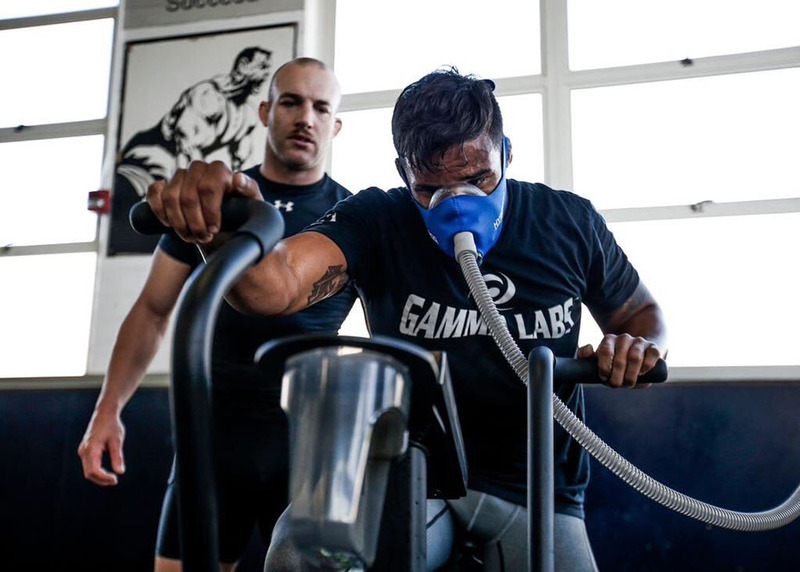 Oestrike said Hypoxico arranged for training systems as small as a mask and as large as an entire room at the U.S. Olympic Training Center in Colorado Springs. 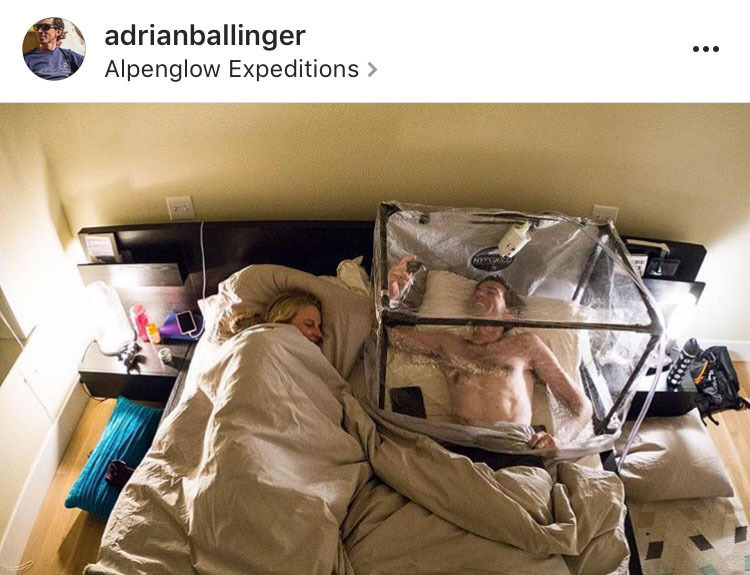 It followed, Ballinger reasoned, that if tents could cause adaptations for endurance athletes similar to living at altitude, they should be able to simulate the acclimatization process in mountaineering, possibly cutting steps out of the summiting process and cutting the risk of various altitude-related ailments like acute mountain sickness or high-altitude pulmonary edema. He tested his hypothesis on an Alpenglow expedition to 8,485-meter Malaku, the fifth-highest peak in the world. The trek to the mountain was so gnarly that would-be climbers often failed before reaching base camp. Ballinger wanted to skip it, flying the group right to 17,000 feet. 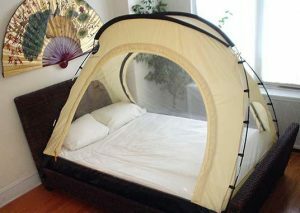 “So we had them pre-acclimatizing using the tents, and we had a 100 percent success rate,” he said. 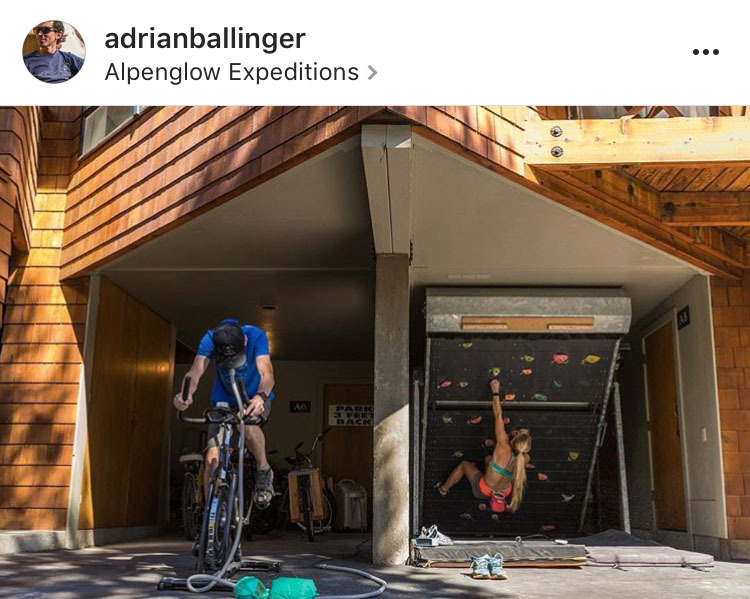 Ballinger began integrating it into his own training – Olympic Valley sits at 6,000 feet – and said by January 2017, all of Alpenglow’s mountaineering trips will have clients pre-acclimatizing using Hypoxico systems in order to shorten the ascent time. “We can cut 30 to 50 percent off the length of a trip with the rapid ascent program,” he said. Ballinger said he and Harrington used Hypoxico systems for about eight weeks before Cho, but that a 6,000- or 7,000-meter peak might only require four to six weeks or pre-acclimatization. To keep from overdoing it, Ballinger employed a sleep tracker and pulse oximeter to measure oxygen saturation in his blood. He and Harrington also “trained high.” They rode stationary bikes using Hypoxico masks – a smaller version of the same oxygen-replacing system as the tents, not the air-blocking masks that became popular a few years ago. 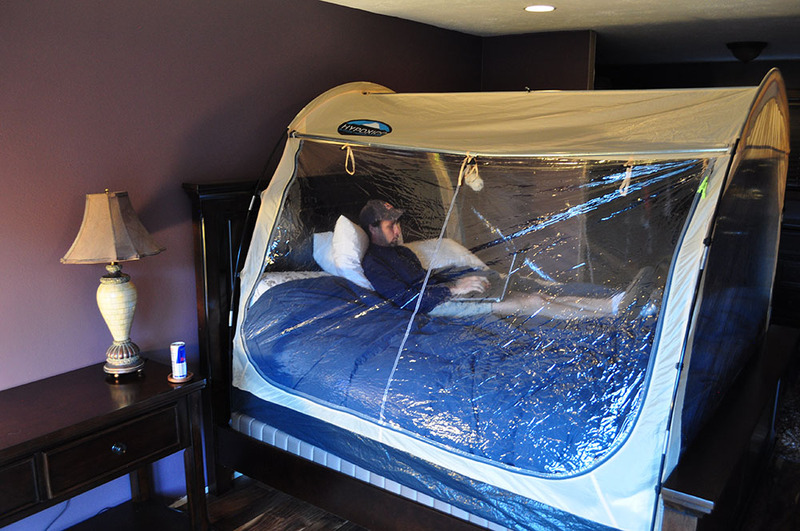 “We usually opt for the head tents,” he said, referring to the Hypoxico product pictured above, which covers only above the shoulders. 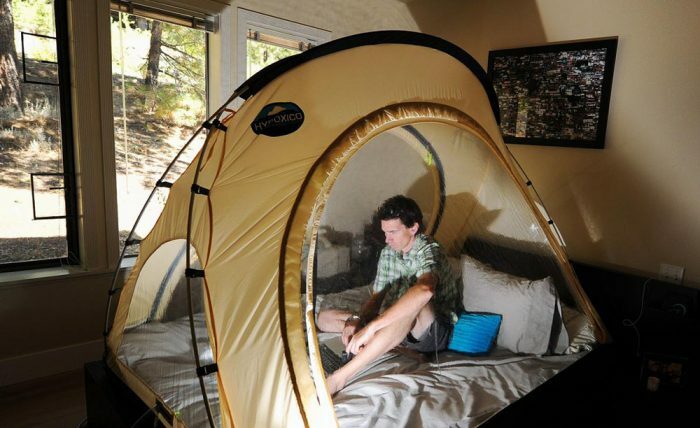 Some have questioned the ethics of altitude-simulating tents or chambers by endurance athletes, likening them to performance-enhancing drugs. Oestrike is quick to point out the World Anti-Doping Agency conducted a review of hypoxic technology and concluded it did not constitute an unfair advantage. “They basically came to the conclusion that if other people can live in Chamonix or Aspen, and train there, then others should be able to simulate altitude training at sea level and level the playing field,” he said.